If you want to know how to create kid-friendly, healthy food, why not ask a kid for help? That’s what Hyatt Hotels did in partnering with 12-year-old chef Haile Thomas to launch a new wellness kids menu. Yes, you read that right. She’s 12. The tween chef, who represented the First Lady’s “Let’s Move” campaign at the State of the Union Address and cooked on the Today Show earlier this month, consulted with Hyatt chefs to tweak kids’ menus while “keeping it fun” (her words). The incredibly poised Haile suggested a whole new take on healthier food by Hyatt, like serving roasted potatoes instead of french fries. She also used her input to insist on food that would be fun. One of the lunch/dinner options is a “Build Your Own” sub sandwich. The deconstructed sandwich (served with whole wheat bread, naturally) comes with turkey, lettuce, tomato and cheese so kids can interact with their food. A similar breakfast choice, “top your own taco” lets kids put together their meal of whole wheat tortilla, scrambled eggs and cheese. And the menus come on interactive sheets with games, drawing space, and a QR code so you can learn more about the For Kids By Kids initiative. The Hyatt kids menu, available at all Hyatt hotels and resorts in North America, includes choices such as organic Greek yogurt, hormone-free low fat milk and cage-free eggs. 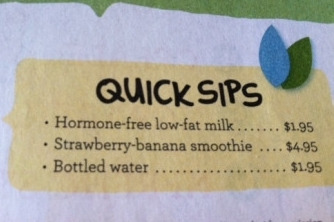 The drink choices are limited to milk, bottled water or strawberry banana smoothies–no bad-for-you sodas. Haile has traveled from her Arizona home to Hyatt hotels around the country, and been a featured speaker on childhood obesity at the Clinton Foundation’s Health Matters Conference., All that traveling has forced her to negotiate airports with their minefield of unhealthy eating choices. Previous Post: « Unnecessary (and Goofy) Hotel Room "Extras"